It was one of my goals lately to buy bigger clothes for my 3 years old son. He’s growing like a weed, so a bigger clothes would be perfect for me. It doesn’t need to be brand new as I’m trying to save more money at the same time, he will outgrown this again so what’s the sense? It’s nice to get some good stuff from your in laws, as it helps you in a little bit. This car sleepwear was given to my son from his Lola Judy. Good thing she gave him this one counts as I have at least 3 more pajamas to buy next time. That is so cute. It is nice that you have family to help you out. My little one would go crazy over the cars! Lucky him to be surrounded with love ones. My kids need some warmer pjs too. It's getting colder fast already. That is so sweet of her. Yeah, a little bit of generosity helps. 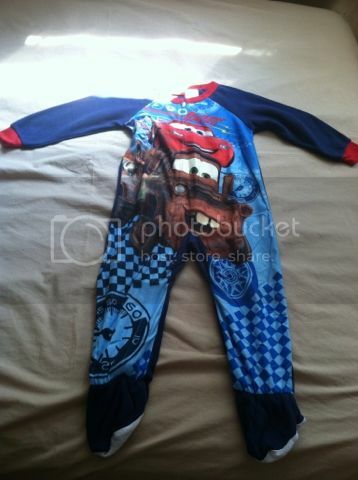 Looks like the same sleepwear that my 2 year old also wear. Those are very comfortable to wear for the kids in this cold weather days. That's what I do when shopping too, making sure that i buy 1 size bigger than their size that way they won't outgrow it so quickly.